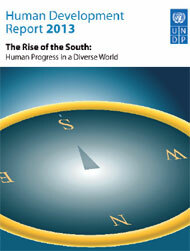 2013 human development report applauds efforts of developing nations. Is India on track? RISE of the developing world, or the South, has resulted in a shift in the dynamics of the global market. This is the underlying theme of the 2013 Human Development Report by the United Nations Development Programme (UNDP). Despite being low on human development index (HDI), a measure of health, education and income, developing countries like India and China have become strong enough to influence international decision-making on policies relating to trade and environment, claims the report. India stands at 136 in the HDI list of 187 countries that spans from Norway at the top to Niger at the bottom. China and Brazil are ranked 101st and 85th. “The new arrangements promoted by the South and the resulting pluralism are challenging existing institutions and processes in the traditional domains of multilateralism—finance, trade, investment and health,” says the report launched on March 14 in Mexico City. Between 1980 and 2010, developing countries increased their share of world merchandise trade from 25 per cent to 47 per cent. Meanwhile, the developing regions strengthened links with each other: between 1980 and 2011, South–South trade increased from less than 8 per cent of world merchandise trade to more than 26 per cent. In terms of tackling climate change “the South is going beyond bilateral approaches by incorporating ways into national development strategies”, says the report. In 2010 India announced it will voluntarily reduce its carbon emissions intensity by 20 per cent of the 2005 levels by 2020. Similarly, China has pledged to reduce its carbon intensity by 40 per cent from the 2005 levels by 2020. Mexico has enacted the developing world’s first climate change law, aiming to cut its emission by half and build the renewable sector. The report appreciates New Delhi’s shift from petrol to much greener CNG for public transport. The report says active government leadership has been crucial in accelerating economic progress and minimising social conflict. “Innovative programmes in Brazil, India and Mexico—conditional cash transfer and rural employment guarantee schemes—exemplify active interest in fostering a more equitable distribution of economic and social opportunities,” it says. In light of such developments, the report calls for better representation of the South in global governance systems and points to potential new sources of financing within the South for essential public goods. The report makes a case for more representation of the South in bodies like the World Trade Organization, says Vijay Prashad, professor of International Studies at Trinity College in Conneticut, the US. India, an example. Really? The report has applauded India’s contribution by way of its spillover development effect on other countries. For example, it says Indian firms are supplying affordable medicines, equipment and information technology services to countries in Africa and the Export-Import Bank of India has extended $2.9 billion in lines of credit to Sub-Saharan African countries. It also appreciates the initiative of the rural job guarantee scheme (see ‘In praise of India’).